Investors are cheering today’s report from the Labor Department–sending the Dow Jones Industrial Average up more than 150 points. The report–which showed that the economy added 203,000 new jobs in November and that the unemployment rate fell to 7%–was good enough to suggest a broadly improving labor market, but not so positive that market watchers expect the Fed to accelerate its plans for drawing down its stimulus efforts. 1. Construction and Manufacturing Hiring Was Strong: The two industries added 17,000 and 27,000 jobs last month, respectively. These sectors are particularly important to the economic recovery because they provide good paying jobs for relatively low-skilled workers. The strength of job growth in the construction sector is further evidence that the recent recovery in home prices is finally leading to a construction and employment boom. 2. The Labor Participation Rate Went Up: The labor participation rate–or the ratio of workers in the workforce to the total working age population–edged up slightly last month from 62.8% to 63.2%. To be sure, this was a very slight increase in the rate, but any improvement in this number is welcome. The American workforce is aging, and as a larger percentage of our population retires, labor market participation is expected to decline. 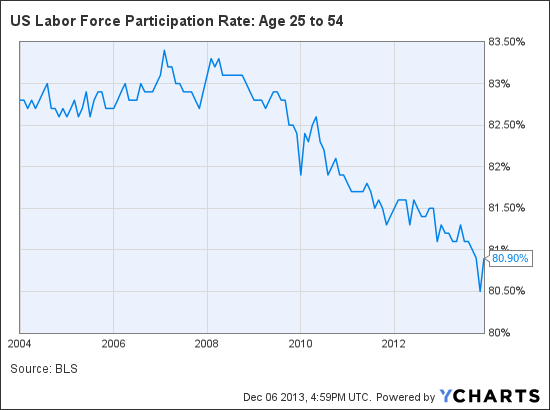 But even among citizens in their prime working years, participation has fallen. As you can see from the chart above, this month saw a spike in the percentage of folks in their prime working years participating in the labor market. For a strong economic recovery to take hold, this trend will have to continue. 3. The Report Wasn’t Universally Positive: Despite these positive developments, it’s not quite time to pop the champagne corks. The monthly jobs report is actually composed of two separate surveys: the household survey, from which the unemployment rate is derived, and the establishment survey, which gives us the total number of jobs added each month. The household survey looked strong this month, but much of this was an illusion created by the government shutdown. If you compare seasonally adjusted data from September to November instead, the total number of employed persons only rose 83,000. As Brookings Institute economist Justin Wolfers pointed out this morning on Twitter, the household data has been consistently weaker this year than the than the establishment survey. Market watchers tend to pay closer attention to the establishment data as they are drawn from a larger sample size, but Wolfers is right to wonder whether the weaker household data is warning us that the job market isn’t quite as strong as data elsewhere in the report suggest.